My oldest son loves him some Curious George. The books, the show (on PBS) and even the toys, but he wouldn’t buy one of those toys because it’s not a superhero or a Planet Hero, but if those didn’t exist he probably would buy some Curious George toys. He and I read Curious George books probably twice a week thanks to the library. Curious George Goes to a Restaurant. Curious George Plays Baseball. Curious George Flies a Kite. Curious George is Bored. Things like that. You know the drill. And no one in this country or world would know about Curious George if it wasn’t for his ubiquitous friend, the Man With the Yellow Hat (MYWH for those in the know). He has no name, no history, he just exists as the Man With the Yellow Hat. We do know a few things about him though. He is an explorer, as we know from the first Curious George book. He also appears to be wealthy, having an apartment in “the city” and a house in “the country” and because if this he is a man of leisure. There are no real world locations in Curious George, but one can assume that given the history of his creators, the husband and wife team of H.A. and Margret Rey, who fled Nazi Germany to eventually live in New York City, that New York is “the city”, but I’m completely and totally getting off topic. The Man With the Yellow Hat is ALWAYS wearing yellow. He never wears blue. He never wears red. He never wears black. Only yellow. And it can only be yellow or else part of his persona and psyche is gone, like a war veteran who lost a limb that can still feel it itching when he gets back to “the world”. This weird character trait would make it difficult for a normal person to shop for clothes, but he does live in “the city”, so he probably gets his clothes tailor-made at some haberdasher, being a wealthy gentlemen and all. And for the love of all that is holy, don’t lose his hat. Few things are worse than this scenario. As he said in one of the episodes of the Curious George show, which I watch with my oldest, “Without my hat, I’m just not…me.” No kidding, Man With the Yellow Hat. Then you’re just “The Man”. A generic plot point in a children’s book. He. Is. Nothing. The Man With the Yellow Hat also seems strange just for the fact that he’s a strapping young guy in a city full of available ogling females who lives with a monkey. Not that there’s anything wrong with that! And he’s always leaving George by himself, saying things like, “Now I’ve got to conveniently go over here. Don’t get into trouble!” What does this moron think is going to happen, George is going to just sit there? Everybody in the books calls the monkey CURIOUS George. There is no “Mild-Mannered George” or “Dullard George”. But all in all the Man With the Yellow Hat seems to live a pretty cool life. He’s an explorer, he drives a convertible, he flies a plane, he has a pet monkey. My oldest would kill for that life. Share the post "The Man With the Yellow Hat is a Very Peculiar Man"
Previous Post: Who Are All These People on Facebook and Why do They Want to be My Friend? You missed a couple crucial points. First all, old man, all the cool kids know that his name is Ted as revealed in the major motion picture of 2006. By implying he has no name dates you as an old timer who must have been born back in the 20th century. Get with it, pops. Second, with that yellow jump suit, isn’t he really the Elvis for monkeys and toddlers? The similarities may not seem obvious if you’re simply viewing him through the eyes of the yellow bound pages. In reality, Ted is dealing with his massive celebrity status, groupies, and huge personal wealth. He holds back on the bling, but one day when they find him unconscious with his head in the toilet… it will all be crystal clear. 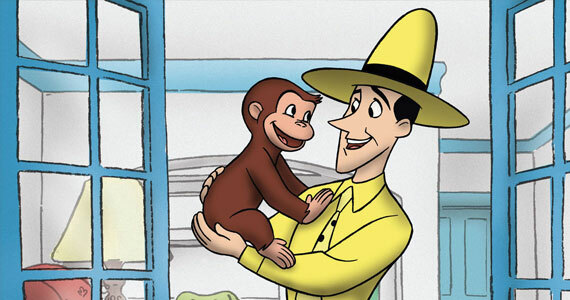 I am intrigued by The Man in the Yellow Hat but at this point – I have not read all the Curious George books- I tend to see him as rather strange; benevolent , yes, but I am not sure I’d want him around any little monkey of child of mine. If he has a life it may be like weak tea with lots of milk. Maybe I am a suspicious, negative old woman, but I’d like to see the results of a psychiatric evaluation. He has given up on much — or seems to have– all for a curious little monkey. His habit of always wearing yellow seems like compulsive behavior. My name is Daniel Moser and I will soon be playing ‘The Man In The Yellow Hat’ in a brand new national tour of CURIOUS GEORGE LIVE! I loved reading what peeps had to say about the character and I’m excited to play the part! Visit my website, or the CURIOUS GEORGE LIVE! website to learn more ’bout the tour! P.S. Hope I look good in yellow! Hi. I wasn’t familiar with Curious George until recently and your comment here led me check out your performance as Ted on YouTube. It’s wonderful. I wish I could have seen it. I know you wrote this quite a while ago but I had to comment. Your observations are spot on. Especially the one about MWYH being incredibly wealthy because he has a nice apartment in the city AND a country house! I guess when you spend your money on yellow clothes and toys for your monkey, you have can save a nice chunk of change. I am “curious” about MWYH’s social life. He doesn’t seem to date much. I have suspected he might be secretly dating Dr. Wiseman (the female professor he seems to spend a LOT of time with) but I don’t know. She has the same kind of Jack (or Jane) of All Trades career that MWYH has. She works at the museum, designs rocket ships, and so on. I think they’d make a great pair. And she’s very tolerant of George’s hijinks. I have a similar theory that I am trying to research – so this thread is giving me all sorts of ideas. But basically, there was a yellow hat – the Judenhut – that was imposed on Jews in Germany in the Middle Ages and seen in historic imagery because it was associated with Jews for centuries. I really think that German Jews would have known that and can’t image this was not a choice to identify him as being Jewish man. But I can’t figure out what they were saying with that…Any ideas? Yes, he’s the kind of unusual gentleman you would have be friendly with if he lived next door, but you’d never leave him alone with your kids! If he shacked up with Dr. Wiseman, I would trust him more. hmf. @CBB I agree. The Professor Wiseman angle, being thrown in as it is, would allude that TMWTYH has some sort of romantic attachment to her, but they’ve never shown that. He makes her dinner, does presentations for her, goes on expeditions when she asks him (and George) to, but they never quite make that connection. It’s a kids’ show, though. I think everyone is thinking about the HBO Curious George miniseries. In the original books Dr Wiseman is a man. Just read this, as my husband, two-year-old daughter, and I will be MWYH, Curious George, and Professor Wiseman respectively for Halloween tomorrow. (And we won’t be entirely in disguise, as my husband is a scientist, I am a woman of color who is a professor, and my daughter is a monkey :[/footnote]. Anyway, my husband and I loved reading all of this, comments too! We couldn’t agree more, have considered all of these interpretations (except the one about yellow and the Star of David…interesting…), and haven’t laughed this loud in a long time! Thanks! Ha ha, awesome. My kid is a Curious George nut. I’m doing some digging on that creep in the yellow hat. Glass to find this old page and the comments. I personally believe the Man is dating Dr. Wiseman because they like each other mutually (although this is to my dismay, because I think is he quite dashing, but I think they’ll make a cute couple, also I love diversity). As we all know the MITYH is rich. It is suspected that he is a major donor to the museum. If that is the case, Dr. Wiseman is in fact just interested in him for his money. Now the money theory can go in another direction. Dr. Wiseman is not his lover, but his finiacial and health advisor/mentor. The MITYH is someone who is really rich, but has some major psychological/ health problem. Dr. Wiseman checks up on him to see if he is not taken advantage of in the city. George is not just there to be the man’s friend, but to be used as a tool to assess the man to see how much he can take care of the monkey in order to see if he is getting better or worse. That is why he goes off into the country- for some fresh air for his health. It could even be said that the man is dying although I doubt it because he’s a marathon runner. Nevertheless, George or the all yellow serves as a distraction for people not to get worried. Dr. Wiseman helps the man see where all his money will be going (projects at the museum) after he is gone. My son (4 years old.) watches Curious George, too. At night he likes to have me make up stories about curious George. I started one story where the MWTYH tells George, “I have to go over to Dr. Wiseman’s apartment for the evening. I’ll be back early in the morning.” Not to be cynical, but just to add some spice to my story telling. My son does not seem to mind, When George gets up in the morning and goes into the MWTYH’s room one morning, he is in bed with only his hat on. My fear is that there needs to be a little more reality in the characters, other than just riding a spaceship to the moon and back. Yeah, I think there is a romantic connection which is kind of nice. New York is full of diversity. I don’t know… he has got me wondering as well. My five year old son loves George and I prefer him watching it over much else that is out there. In any event – you all are much more benign in your theories than where I was heading. I really just have a hard time figuring out why aside from Dr. Wiseman, the only other personal friend TMWTYH seems to have is the young boy Bill… Aside from that he does seem rather genuine albeit a bit socially nonobservant. Maybe he has Aspergers??? Actually, he does have more friends than that, such as the chef, the Renkins, and many of the store owners in the country. I have spent a little time looking for the exact reason that TMWYH wears his yellow outfit. At first I thought he could be some sort of Ranger as he reminds of a Canadian Mountie type figure. I know his name is Ted and that he also works for and is Director of the local museum of Science in the City. This I believe is his primary job. After reading the back story I think the outfit came from his exploring days back in the jungle, which was written around the 1940’s . The outfit probably made more sense back then but it fits perfectly into his character now as he is the slightly eccentric Museum director with his own monkey. As for a partner, although it passed my mind briefly, the whole point of Teds character is to be a loving and supportive guardian for George whilst keeping him relatively safe. George would see a partner as conflict and this would never work in the dynamic of the storyline. Curious George is a gem, it can not and should not be altered in any way, the stories are stunning for children and the inner-child of the parent. Nothing flash, just good wholesome educational fun. What if MWTYH is the son if a wealthy NYC scion who happened to have an imaginary friend named George, that is a monkey, as a child but then suffered a full blown psychiatric meltdown as a young adult, resulting in split personality disorder. He is the one who actually gets into hijinks (notice he is never around when George gets into trouble?) but blacks out when he is his George personality. The family has spent a lot of money since childhood trying to help him but has finally just bought off an entire cast of people to watch over him/go along with his adventures. And damage or issues are dealt with by the family in hopes of never disrupting their son’s fantasy. I always thought MWYH was yellow as a basic representation of the sun, the main symbol of Godliness. so it would all be about telling kids about a Special Being who is caring and forgiving, always present somehow and expecting you to behave good but leaving you to choose with your free will. and I have no religious view… its just the way it hits me, and also that it would explain how he is interested in everyone else in the same detached but caring way, always lending a helping hand to everyone, always a good character, one that is mysterious and appealing but unreachable. yes he seems extremely dumb at times, and I suspect on purpose to make it less obvious. My little sister loves this show. It’s all she watches. Anyways, I’ve read all the comments and my theory still feels right to me. I think because MITYH found George in Africa, and all humans look the same to a monkey, he always wears yellow because that’s the color he was wearing the day he found George. This checks out because whenever he loses the Man, he looks for the yellow hat. Otherwise, George May never find him. Honestly, I’m thinking Professor Wisemen friendzoned him. He gravels at the woman’s feet making her dinners, remembering her birthday, and running errands for her so obviously he digs her. I’ve been watching the show along side my 3 year old boy who loves George for the past 6 months. My conclusions about the mwtyh is he is a scientist and George is the experiment i don’t think he is rich and that the museum pays for everything like the apartment in the city the house in the country. I think they are trying to see if monkeys can co-exits in cities with humans so a long term study is needed. I think thats why he comes off so cool when George get into trouble. The apartment building is also yellow I assume he is the owner. It’s the only thing that makes sense. How else could he get away with keeping a monkey in the apartment and not get evicted for all the crazy hi jinx that go on in there. Also I’m confused about the name Ted. If it wasn’t in any of the Rey books its not his name. I’ve never seen the 2006 movie but was it actually in the movie? Thought I read it was a deleted scene. This is a horrible theory. I will show you things that you messed up on. 1 The Man with the yellow hat name is Ted. 2 Ted isn’t a stranger he’s is George’s caretarker and he works for the museum. There is a tv show based on the books you should watch it. They have tons of movies I’m surprised you never heard of them. The movie and show, while having the same voice for the mwyh, are not in continuity. Look at the apartments and doormen. Look at the museum. Not continuity. Ted is movie continuity and museum director. Not show. In the show he owns the country house out of inheritance, and goes to work. Maybe as an graphic designer as indicated in 1 episode where he designs zoo signs and the number of times he compiled scientific reports (not wrote). He worries about cost of things, but also spends his money on george and not fancy things (eg. Loves his classic vintage old refrigerator). His doctor tells him and george he is incredibly healthy. And he has many friends (chef pasgetti, the whits, prof wise men,firefighters, the rankings…. He bird watches with them, helps them with work and on the farm, is in a band) he also is friendly with his kids friends and their parents as we all are. As sprout master (Boy Scout leader type) he also has a patient tolerant relationship with annoyingly smug yet simple bill. He is a leader in his community and helps with community projects, while single parenting george who is no less supervised then allie, bill, Steve, Marco or Betsy. George is best friends with a squirrel, pigeon, cat, 2 dogs, a preschooler, grade 4 student, grade 5 student, and bill who is clearly 12 or older… George is ageless. Sometimes he is capable of 12 year old things and sometimes he is capable of toddler level. Because he’s not a person. Therefore setting limits for him is tricky. The man enjoys reading, nature, jazz, tuba and science. He’s not crazy. Odd. But I think the show shows that everyone is odd in their own way. Ted, TMITYH’s name, means rich or happy, and protection. He seems rich, and is trying to protect george. I just thought I’d point that out. Hello; I’ve always had this theory that TMWTYH and professor Weismann were dating prior to George got pregnant but due to her career Weismann wanted to give it up for adoption and TMWTYH wasn’t exactly all for it . I mean look at bill he resembles them both he has the mans features and Weismanns skin color and brains. Plus they never show bills parents…why? The man keeps his distance but still gets to know bill aka his son ,Weismann has no clue and to fill the void of fatherhood he took George in. And he is totally still banging Weismann why do u think he runs off in such a hurry to help her he’s hopelessly in love with the woman that’s why he’s always taking her out, cooking her dinner, he’s always running to help her when she needs him. Duh…if u watch the movie on Netflix Ted goes to Africa to find an idol to save his job at the museum. Before he goes he gets a suit to wear which is all yellow…a joke to the store owners which have ordered these by accident. I find it funny tbat you are questioning this cartoon character named Ted…really…its all make believe…and to make it into so.ething it is not shows that you have way too much time on yout hands. George is a wonderful character that has endered ages. Please leave it at that! So, I mentioned this in response to a posting made years ago and realized I might get more responses posting it at the end. I have a theory that I am researching (actually for a book on the color yellow in Jewish history). There was a (pointed) yellow hat – the Judenhut – that was imposed on Jews in Germany in the Middle Ages and seen in historic imagery because it was associated with Jews for centuries. I really think that German Jews would have known about that hat and I can’t imagine this choice (especially given it is his NAME) was not to consciously single him out as a Jewish man. I just think the shape is an Americanization of the hat. In the 1930’s and 40s, the shape is much more in line with a cowboy hat rather than a safari hat of that period when the book was written. But, I’d love some ideas on why the writer would have used this hat (used as an imposed negative marker) would have been his choice in this case. …Any ideas? The man in the yellow hat had a wife and child and were all involved in an accident he lost his family and is now sterile. He rescues a monkey who reminds him of his son and raises him as such.